For being such a Little Big Town, Jacksonville’s local restaurants have surprisingly been featured on numerous food shows. Some notable ones include Metro Diner, 13 Gypsies, Singleton’s, and Culhane’s Irish Pub on “Diners, Drive-Ins and Dives” and Maple Street Biscuit Company on “Guilty Pleasures.” A lesser known is one of my favorite Downtown spots, Olio on “Adam Richman’s Best Sandwich Restaurants.” Richman features Olio’s best known sandwich and a staple of the River City scene: the Duck Confit Grilled Cheese. I hope your mouth is starting to water….but I’ll get to that soon. 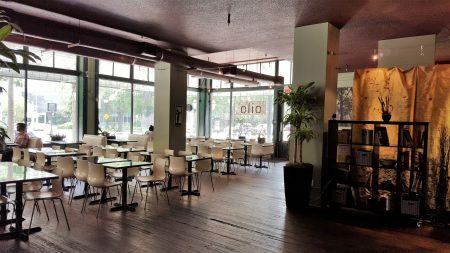 Olio Restaurant is nestled on the corner of East Bay Street and North Market Street with the river visible across the way. Glass windows wrap around the building with green accents that make you feel welcomed and want to stop in for a bite. 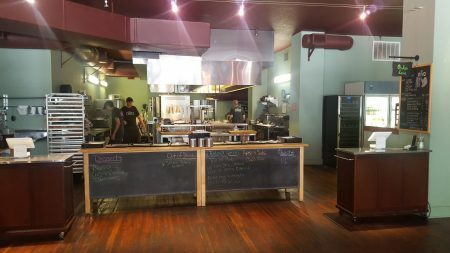 Inside is a beautiful and quaint open kitchen where Executive Chef and owner Greg Desanto and crew of talented chefs are slinging some of the best fast casual dishes for breakfast and lunch in all of Jacksonville. The sage colored walls are covered with local artwork that are as eclectic and eye catching as the menu. As I perused the lunch menu I noticed most dishes boast clean, fresh, approachable Southern ingredients that are broken down into Soups & Salads, Sandwiches, and Entrees. There’s also a chalk board at the register listing Today’s Specials, Special Sides and Quiche. For the adults, Olio also offers a selection of beer including Fat Tire, Jon Boat, Henry’s Hard Soda, and house wines. After much debate, because every dish sounded drool-worthy, my friends and I placed our order and grabbed our drinks. If I wasn’t excited enough already, Oilo can be added to the list of restaurants with my favorite (!) crushed ice. Yes, I realize that’s silly, but it’s the little things in life y’all. We grabbed a booth lining the windows and eagerly awaited our lunch. Fortunately there wasn’t a long wait and our food was ready in no time. Served on plastic trays with metal silverware our feast was about to commence. We started by sharing the Vichyssoise ($4) and Salmon Salad ($11). Vichyssoise is a classic French potato soup traditionally served cold. 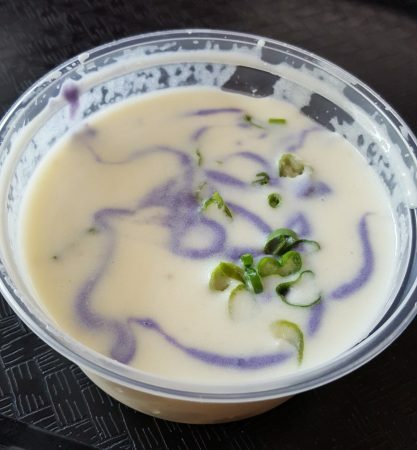 A fun twist was their addition of bright purple potato puree, swirled into the creamy white soup. Garnished with chives, we did find the soup bland and needing salt. It was however velvety and cool, a refreshing appetizer on a hot summer day. The soup was the biggest let down, but to our luck, the meal grew exponentially better from there. The Salmon Salad definitely out shined the soup, with copious amounts of veggies nearly overflowing the bowl. It didn’t even strike me at the time I could ask for a temperature on the salmon, but to my surprise it was cooked to medium. I’m sure they would accommodate any temperature preference so keep that in mind. 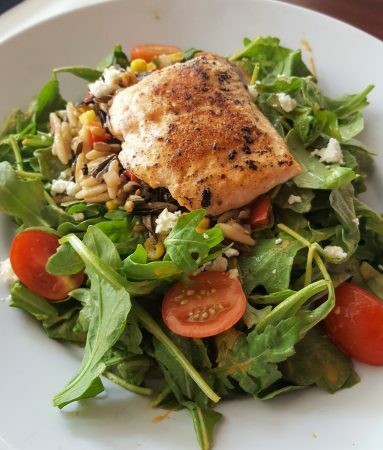 The salmon was sitting pretty on top of a heaping mound of peppery arugula, cherry tomatoes, grilled corn, red peppers, feta, cranberries and orzo. The salad was expertly balanced and hit every note of flavor. Acid from the tomatoes, tartness from the cranberries, smoothness from the feta, sweetness from the corn-it was a complete and satisfying dish. The smoked tomato-basil vinaigrette was a compliment to the cornucopia of veggies and a surprise bit of kick at the end. Our sandwiches and entrée were nothing short of exceptional. 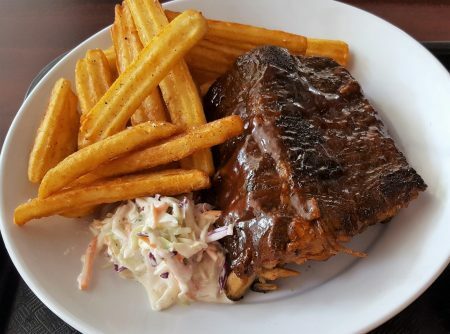 I ordered the Baby Back Rib Frites ($13) and let me tell you-for not being a BBQ restaurant-this plate did not disappoint! Forewarning though, come with plenty of napkins and no judgment. These ribs were dripping with ketchup based sauciness that was a whole lotta mess. I prefer tomato based BBQ to vinegar or mustard, so I know this isn’t for everybody. They even provided a side of sauce if that wasn’t enough already. The meat nearly fell off the bone and I attacked the ribs with my hands and reckless abandon. My friends and I loved it, but our only critique was that we did miss that beautiful crust you get from grilling or a high temp oven. The coleslaw was the stuff of my dreams. I love thick creamy coleslaw versus vinegar or drier slaws. This mix of cabbages, carrots, jalapenos, and spices was just different enough from your mundane slaw to compliment the succulent meat perfectly. Lastly, were the thick cut steak fries. Nothing super special here except the aioli it was served with. I border on the line of obsessive over this basil aioli. I dare you not to put it on EVERYTHING. Now on to the sandwiches! The Pastrami ($10) and Duck Grilled Cheese ($8.50) were both great in very different ways. 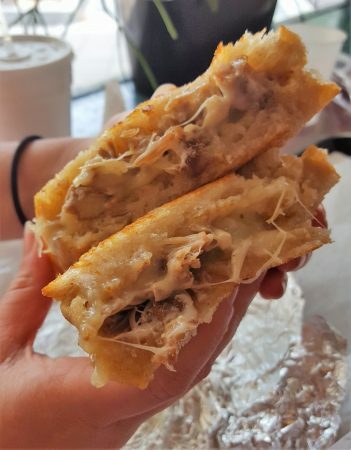 There is no question why the Duck Grilled Cheese made it on “Adam Richman’s Best Sandwich Restaurants.” The foundation of any good sandwich starts with the bread. This thick cut sourdough was toasted to a light golden brown and held the insides like a warm crunchy hug. The star of the sandwich is clearly the duck confit. They slow cook duck thighs completely submerged in a fat until the meat falls off the bone. The duck is salty, rich, flavorful, and elevates your typical grilled cheese to a new level. They used gruyere (think Swiss without the holes) and white American cheeses to balance out the duck, and green tomatoes to add a tang. My best friend orders this sandwich every single time we go to Oilo but don’t hate me, it’s not my favorite. 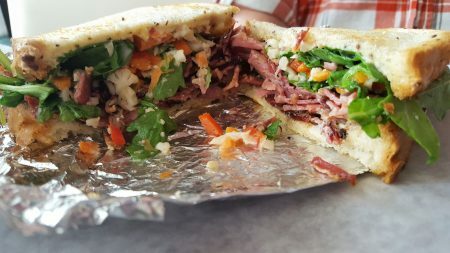 I understand why it works and how unique it is to the Jacksonville scene, but for me there are more complex sandwiches…like the Pastrami. The chefs actually house cure and smoke their Pastrami and slice it thick. Keeping with the classic Pastrami, they use rye bread, but that’s where the similarities end and my love for this sandwich begins. The chefs raise the bar by cramming it full with pickled cauliflower, peppers, carrots and arugula, all adding brightness and unexpected twinge of vinegar. The honey infused goat cheese rounds out the sandwich with a bit of sweetness from the honey and silkiness from the cheese. For me the Pastrami was more exciting and an unanticipated twist on an American classic. Olio Restaurant has always been a destination spot for me in Jacksonville. If it is enjoying breakfast, lunch or a quick bite in the middle of the day, you’ll wish it was open for dinner as well. Offering composed Southern plates that are familiar yet unique, you’re bound to find a new favorite downtown. With prices that won’t hurt your wallet in a relaxed and fun atmosphere, it is bound to make everyone in your group happy. Now get out there and try the Duck Grilled Cheese and see if it lives up to its name as “One of the Best Sandwiches in America” or venture out to anything else remarkable on the menu. Tagged american, Beer (Breweries and Restaurants), breakfast, Casual, downtown, good ice, lunch, Salad, sandwiches, Serves Alcohol, Soup, southern, Southern/Soul. Bookmark the permalink.